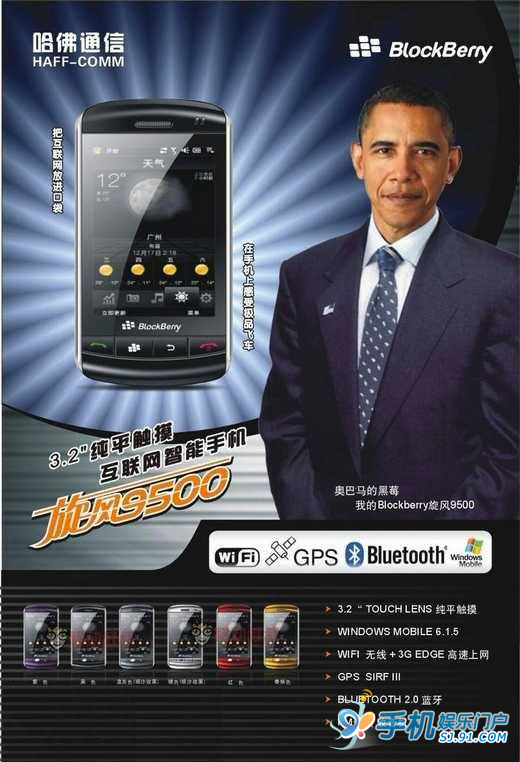 Created by HAFF-COMM ( 哈佛通信，“哈佛”also the Chinese translation of Harvard), a copycatting smart phone named “BlockBerry” together with its poster is all over China’s internet; distinguishing it from the rest is U.S. president Obama’s image as “spokesperson”. In the poster of “Storm 9500, pure flat touch Internet smart phone”, Obama wears a smile. 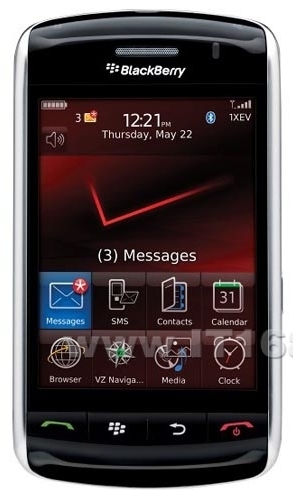 The sentence below reads “Obama’s blackberry, my BlockBerry storm 9500.” The copycat’s appearance is also highly similar with the original BlackBerry Storm, but with a Windows Mobile system inside. 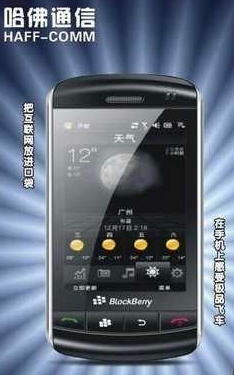 The original BlackBerry Storm 9500 series vs. its Chinese copycat BlockBerry Storm 9500. There’s been no detailed information of this HAFF-COMM company, which apparently doesn’t exist at all, and definitely has no relation with Harvard University. The company appears to be a made up Brand form a factory in Shenzhen. 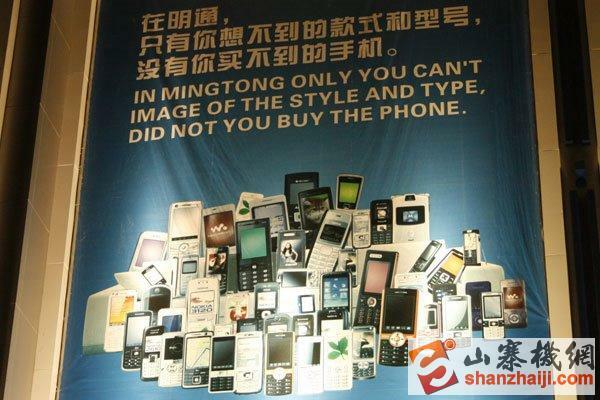 Picture of a poster in a Shanzhai (copycatting) electronic products mall in Shenzhen. The fake Obama endorsement phone didn’t occur recently, as soon as he swore in in January, the first shanzhai phone called “Obama” was out in the market in his hometown Kenya, Africa. No doubt this is just another work of one China copycatting company. This copycatting mobile phone adopted the same strategy as the new BlockBerry, using Obama as the spokesperson with a giant picture of him on the poster. 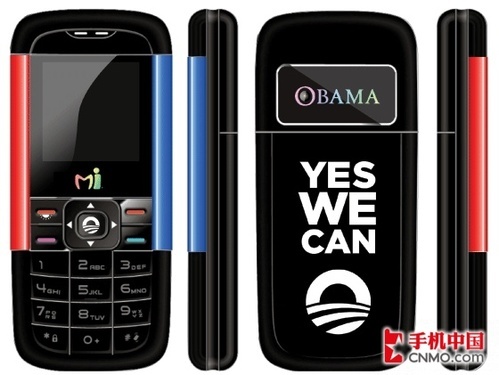 While HAFF-COMM copied BlackBerry, the African version copied the Nokia 5300 XpressMusic; HAFF-COMM takes advantage of the fact Obama likes to use BlackBerry, while the African version printed the campaign slogan “Yes, we can” on the cell’s back cover. Few companies in the world dare to be as bold as HAFF-COMM. The case has made many Shanzhai companies in Shenzhen very nervous of legal retribution. If you can’t find the factory, what can you find? A group of stupid journalists. I just don’t understand. Is there anything Chinese don’t dare to do? As a Chinese, don’t you feel ashamed? People even cheer for this. It’s enough those Shanzhai factories lose face domestically, why even be disgraced in the international market? What’s left besides money in your Shanzhais’ eyes? “Upper lip touch to the sky, the lower lip to the earth, no need of face”. As a Chinese I feel ashamed for you. Are the Ministry of Industry and Information people all useless? Shanzhai is so rampant, shouldn’t you make a self-criticism??? You always say how Shanzhai harms China’s credits. Don’t you think why Shanzhai is growing? Without need, why would it be produced? Such smart Chinese, why not do something that credits our country? HAFF mobile sir, do you dare to print the pictures of boss Hu and boss Wen (Chairman Hu Jintao and Premier Wen Jiabao). Then I will admire you! Different people have different views toward the news. I think understanding from any level has its reason. Not to mention the rational, publicly recognized right thoughts. To digest from the other side, Shanzhai indicates a passive influence for eagerness for instant success and quick profits, but indeed helps to promote China to the outside world. No wonder why many foreigners doubt “made in China”, it’s all resulted by those short sighted businessmen who ruin their self images, only focus on the short term interests, and thus make a uncountable long term loss. Take it as entertainment everyone, don’t be too serious, although the company has no innovation, it does have some creativity, haha. Fake ones can also be used, and also cheaper. Chinese are just realistic, I myself don’t support any foreign stuff! Shanzhai is also a way China’s companies walk into the world. That would be so wonderful if there is a Shanzhai petrol, then petrol won’t be so expensive like crazy! Shanzhai mobile is an epitome of the disrespect for intellectual property rights, and it shows how Chinese rush for instant success and quick profits. There are many products use Mao Tse-Tung’s image in other countries. If the U.S. makes fake endorsements of China’s leaders, how would Chinese react? Obama often joke himself in his promotional video, not to say Americans. They are not like us that can’t take any joke, easy to magnify a problem to be a question of principle or ideology and even harmony. The Wall Street Journal/China Journal article mentioned above is here. Next article 1 Year Anniversary: Thank You! Welcome to chinaSMACK. This is an archive of announcement posts and other posts without a specific author.